Fresh fruit grown in your backyard is a summer treat and the trees provide welcome shade from the heat of the day. 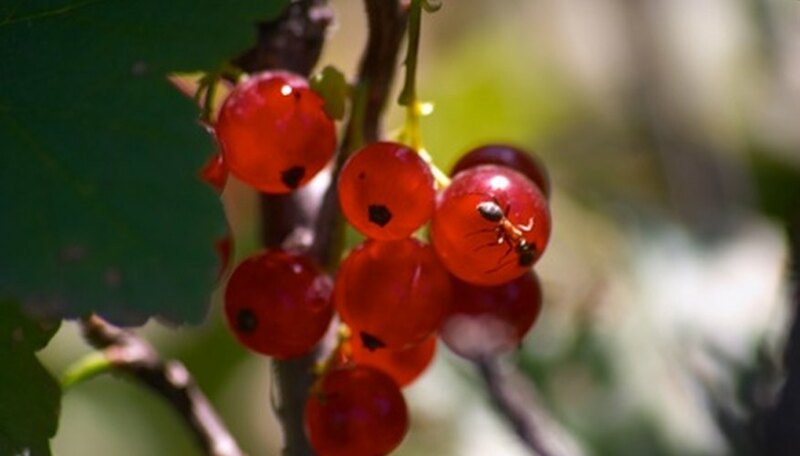 It is common to have insect pests in fruit trees and ants are often seen. However, ants marching all over your fruit is a bit of a concern and can make your fruit less appetizing. Most ant infestations are an indicator of other issues in the tree, but they are also attracted to ripening fruit. Usually you will see small black ants in fruit trees. They need a balance of protein and carbohydrates which they find in insects and nectar or honeydew. The ants don't live in the tree but will have a nest nearby with a queen who lays all the eggs. The other ants perform special duties depending upon their modification. Some are defenders, some hunt and some take care of the eggs. Food is also procured for the queen and brought to her inside the nest. Ants won't cause damage to the tree itself. They can damage fruit and their presence is unsightly. Ants will not eat leaves or wood unless they are carpenter ants, but may harvest plant debris for their nests. Ants are known to swarm over extremely ripe fruit, being attracted to the scent and the sugar content. Ants will protect their food source, which in many cases is honeydew, the excretion produced by scale and aphids. Scale is a flat disc-like protrusion on tender branches. Under the protrusion is the insect who is busy sucking the sap out of your tree. Soft scale is the type usually seen on fruit trees and they can cause the tree to look stressed and drop leaves. It is unlikely they will kill the tree but they release honeydew as an excrement which coats tree parts and invites black sooty mildew. The honeydew also attracts flies, wasps and ants. Aphids are tiny little insects that come in a variety of colors from white to black and several shades of green. They attack buds, young shoots and leaves and ingest the plants sap. They can kill off the buds but generally will not kill the tree, although entire infestations can cause stunted growth and decline in the tree. They also produce honeydew, a substance that the ants desire. Ants will often protect and herd aphid colonies so they have a ready supply of food. Think natural and organic when considering your treatment method. There are tree collars you can purchase that will deter ants and cause no toxic introduction to the fruit. Additionally, there are insecticidal soaps and horticultural oils that can kill the existing pests and drive ants away to find more fertile ground. You can also lay sticky traps at the base to snare the insects.